SPRINGFIELD, IL (07/19/2018) (readMedia)-- SPRINGFIELD, Ill. – Approximately 135 Illinois Army National Guard Soldiers who served in Kuwait and other parts of the Middle East returned home July 18. The unit mobilized in September. 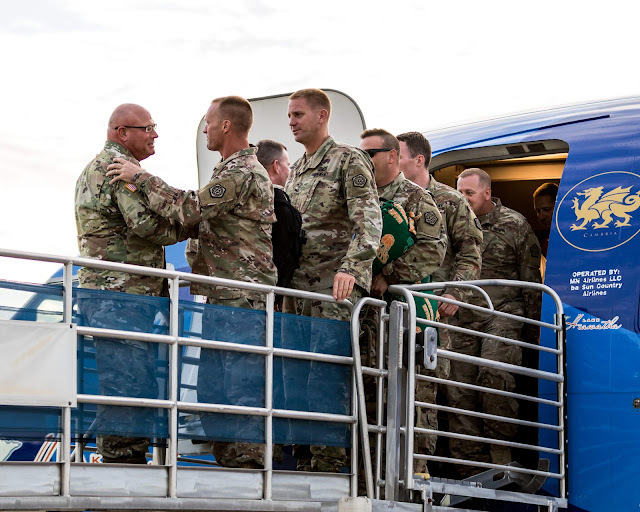 While in the Middle East, the 3637th Support Maintenance Company was responsible for maintenance and support to nearly 90 units deployed to the region in support of Operations Spartan Shield and Inherent Resolve. The main body was stationed at Camp Buehring, Kuwait. Meanwhile, Maintenance Support Teams conducted sustainment operations in six locations in Jordan, Syria, and Egypt as well as multiple locations in Kuwait. Overall, more than 60,000 man-hours were performed on more than 7,200 work orders to sustain thousands of pieces of equipment. The unit conducted more than 300 maintenance support missions, along with more than 100 vehicle recovery missions. Additionally, the unit logged more than 165,000 miles transporting cargo on more than 90 missions. Five Soldiers earned the German Armed Forces Proficiency Badge. The unit was also recognized for its outstanding achievements, receiving more than 250 awards and decorations for their service. This was the largest single unit deployment of Illinois Army National Guard Soldiers in three years.